Is it wrong for the first recipe I post to be something other than a muffin or an egg sandwich? Cinnamon rolls are sister pastries to the muffin so I think they count. I just couldn’t resist making these since I realized I had some leftover mashed potatoes around. That’s not something I usually have in the fridge. 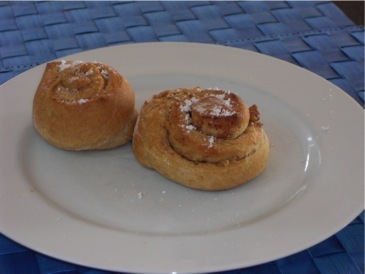 These particular cinnamon rolls also sounded relatively healthy to me. They don’t have extravagant amounts of butter in the dough or copious filling. In fact, I think I would give them a little more in the way of filling next time I make them. I might try brown sugar instead of honey for that application. I’ll admit, I may have been a little stingy with the honey and walnuts since I wasn’t really measuring them. Other than that (and substituting soy milk for regular milk because it was al I had) I stuck to the recipe. The recipe came from Horn of the Moon Cookbook, a collection of recipes from the Horn of the Moon vegetarian restaurant in Vermont I’ve never been to the restaurant but, based on this cookbook, it sounds like someplace I would enjoy. I got the cookbook from a thrift store in California. There are some intriguing muffin recipes that I’d like to try in it too (like maple almond muffins). I have always been intimidated by yeast breads. My attempts at pizza dough never turn out quite right and I’ve never been brave enough to make a full-fledged loaf. After successfully baking yeast-risen muffins from Laurels Kitchen, cinnamon rolls seemed like a good next step. I’m really proud of how the dough turned out. It was easy to work with when forming the rolls and perfectly fluffy when baked. I’m not sure what the potatoes bring to the dough (calls for a little research). I doubled the recipe, which was very easy and made exactly 16 rolls, and froze half for another saturday morning. Like I said before, the only thing I would change is the filling ingredients to either more honey or brown sugar instead of honey. Raisins would be nice as well. The original recipe suggests them in the instructions without including them in the ingredients. The verdict from my roll testing committee: Three, including me, said “tasty but could use more sweetness”. One said “just right”. We all got a slow start this morning. Anticipation of Hurricane Earl’s arrival here in Maine kept us up last night. Now it is a bright, sunny day and I’ve already accomplished what I set out to do: bake these! Bring milk to a boil in a small saucepan. When it reaches a boil, turn off heat and add potato, butter, and honey. Next, combine yeast and warm water in your mixing bowl of choice. Stir to dissolve. Add the potato mixture to the yeast and water. Beat in egg and salt. Add 1/2 cup unbleached white flour, mixing well. Then add the remaining white and wheat flour. Cover and leave someplace warm to rise until doubled in size (this takes about 1 hour). Punch down dough and knead on lightly floured surface. Then let it sit for another 10 minutes. Roll out to 1/4 inch thickness in an approximately 9×15 in. rectangle-ish shape. Brush 1 tablespoon melted butter over the dough. Drizzle with 2 tablespoons honey. Sprinkle with cinnamon and walnuts. Roll dough up from the shorter side so you have a short but thick roll. Cut into 1 inch thick slices (or whatever size gives you 8 rolls) and set 1 inch apart on a baking sheet covered with cooking spray or, as I did, a silicon mat. Brush with remaining tablespoon melted butter and devour.